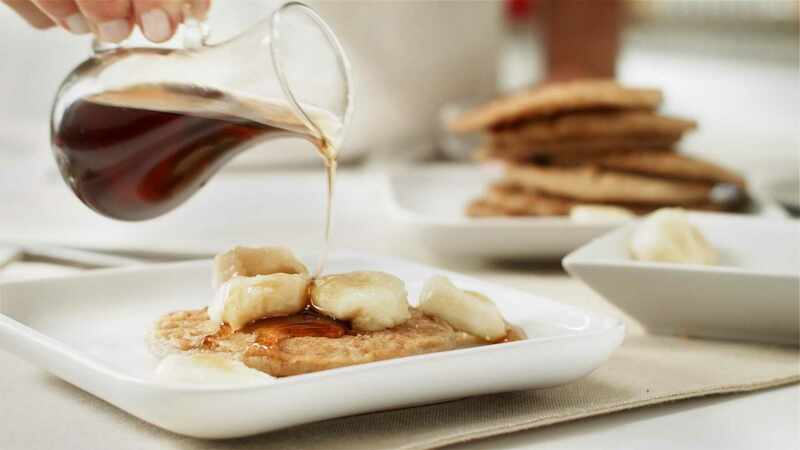 These banana pancakes are hearty, thanks to a batter made with rolled oats, whole-wheat flour and plain yogurt. Replace 1/4 cup flour with ground flaxseeds or ground pumpkin seeds for a nuttier flavor. In a large bowl, combine the oats and hot water. Let sit for 1 to 2 minutes until the oats are creamy and tender. Stir in oil and sugar; set aside to cool slightly. In a medium bowl, combine the flours, baking powder, baking soda, salt and ground cinnamon; whisk to blend. Add the milk, yogurt and banana to the oats and stir until well-blended. Beat in the egg. Add the flour mixture to the oat mixture and stir until just moistened. Place a nonstick frying pan or griddle over medium heat. Once hot, spoon 1/4 cup pancake batter into the pan. Cook for about 2 minutes, until the top surface of the pancake is covered with bubbles and the edges are lightly browned. Flip the pancake and cook for another 2 to 3 minutes. Repeat with remaining pancake batter. #FlashbackFriday 1956: Why move an elevator?